It’s been a while, hasn’t it? A few weeks ago, I went out for another long training run, and it was horrible. I was hoping to head somewhere near a half‐marathon distance. Instead I did a horrible, slogging, slow 10K, and hated every minute of it. I’m not entirely sure why — I may have been over‐training, as I’d done quite a few longer‐distance runs in the previous couple of weeks. And it was the evening, and maybe I was tired. And, possibly, I might have been injured, as well. Because the Monday after that run, I could barely walk. I think I might have trapped a nerve, or something; certainly I was in a pretty poor way. Luckily that extreme didn’t last for long, with the pain gradually fading over the next couple of weeks. But it wasn’t conducive to getting out and training. So I didn’t. I didn’t run at all, in fact, until yesterday’s Bristol Half Marathon, though I did cycle a fair bit, just geting around town. So. I was pretty worried that I’d have another experience like my horrible Bath Half in March. Luckily, that turned out not to be the case. I got a good night’s sleep on Saturday, after having some lovely lasagne cooked for me by my friend Emmeline. Sunday’s weather was great for running — cool and overcast, but dry — and I was feeling fairly optimistic by the time I got to the start line, even though I’d started the day with a bit of a headache. It helped that this was my fifth half‐marathon, so I’m starting to feel a bit more blasé about them now. But it didn’t seem to do my race any harm. 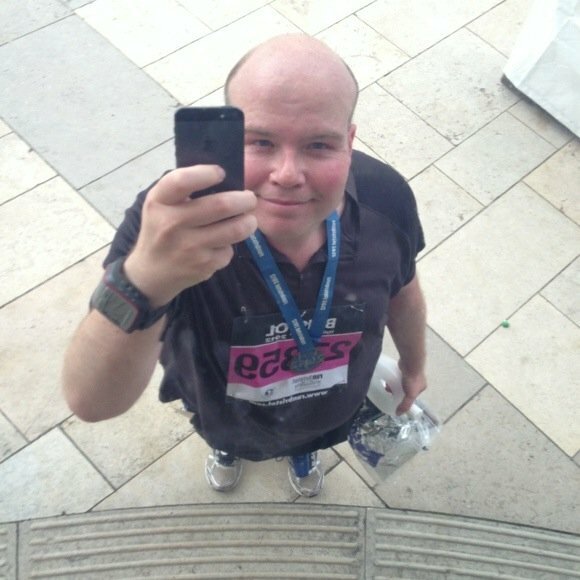 I went happily through the 10K mark (where I pretty much ran into a wall on the Bath Half) and carried on jogging fine until the last two or three. At that point my legs started feeling a lot heavier, and I had to rely more on will‐power and encouragement from the crowd to pull me round. But I carried on plodding, albeit rather less steadily if the RunKeeper track and stats are anything to go by, and crossed the finish line without ever dropping back to a walk. Emmeline met me and accompanied me slowly up Park Street for my traditional post‐race Rocotillos milkshake (strawberry, this time 🙂 ), and then I headed very, very slowly home for a very, very long bath. Hurrah! All that, and I’ve raised a bit of money for Children’s Hospice South West, too. It’s not too late to bump up my total, if you’re inclined. My Just Giving page is here. Thanks! Congrats! Glad it all went smoothly and well done on running all the way!